Sports are forms of competitive physical activity. To me? Flirting is just like a sport. Lou Bega, "Mambo No. 5" (19 April 1999), A Little Bit of Mambo (19 July 1999), New York: RCA Records. In the case of a people which represents many nations, cultures, and races, as does our own, a unification of interests and ideals in recreations is bound to wield a telling influence for solidarity of the entire population. No more truly democratic force can be set off against the tendency to class and caste than the democracy of individual parts and prowess in sport. Calvin Coolidge, as quoted in The Democracy of Sports (22 May 1924), National Conference on Outdoor Recreation, Washington, D.C. He's long ago given up hope of finding a country anywhere in the world where it was safe to tell total strangers that he had no interest in sports whatsoever. Greg Egan, Zendegi (2010), Ch. 3. 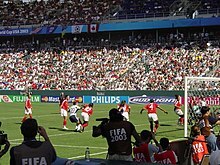 Sport is linked with the technical world because sport itself is a technique. The enormous contrast between the athletes of Greece and those of Rome is well known. For the Greeks, physical exercise was an ethic for developing freely and harmoniously the form and strength of the human body. For the Romans, it was a technique for increasing the legionnaire's efficiency. The Roman conception prevails today. Jacques Ellul, The Technological Society (1964), pp. 382-383. It is a poor sport that is not worth the candle. Nec luisse pudet, sed non incidere ludum. The shame is not in having sported, but in not having broken off the sport. Horace, Epistles (c. 20 BC and 14 BC), I. 14. 36. This is worth living for; the whole sum of school-boy existence gathered up into one straining, struggling half-hour, a half-hour worth a year of common life. Thomas Hughes, Tom Brown's School Days (1857), Part I, chapter 5. Many more people in the world are concerned with sports than with human rights. S.P. Huntington, The clash of civilizations and the remaking of world order (1997), by Samuel Phillips Huntington, Simon & Schuster, p. 197. One great reason why many children abandon themselves wholly to silly sports, and trifle away all their time insipidly, is, because they have found their curiosity baulk'd, and their inquiries neglected. When I play with my cat, who knows whether I do not make her more sport, than she makes me? George Orwell, 1945-12-14. "The Sporting Spirit", Tribune. If somebody whispered to me, "You can have your pick,"
Stirring deeds of contest follow, till I'm bent and gray. to sport would be as tedious as work. William Shakespeare, Henry IV, Part I (1597), Act I, Scene II. God has enjoined us to deal calmly, gently, quietly, and peacefully with the Holy Spirit, because these things are alone in keeping with the goodness of His nature, with His tenderness and sensitiveness. ... Well, how shall this be made to accord with the shows? For the show always leads to spiritual agitation, since where there is pleasure, there is keenness of feeling giving pleasure its zest; and where there is keenness of feeling, there is rivalry giving in turn its zest to that. Then, too, where you have rivalry, you have rage, bitterness, wrath and grief, with all bad things which flow from them—the whole entirely out of keeping with the religion of Christ. Tertullian, De spectaculis, Chapter 15. The addiction to sports ... marks an arrested development of the man's moral nature. For neither if there were a good boxer among the people, nor if there were a pentathlete or wrestling, nor again if there were someome swift of foot - which is most honoured of all men's deed of strength - would for this reason a city be better governed. Lesher, James H. (1992). Xenophanes of Colophon: fragments : a text and translation with a commentary. University of Toronto Press Incorporated. pp. 15. ISBN 0-8020-8508-3. Retrieved on 2011-03-25. This page was last edited on 8 November 2018, at 00:49.